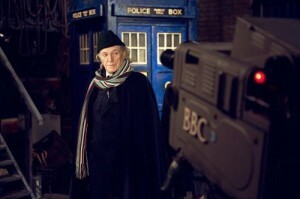 An Adventure in Space and Time goes back to the beginning of British cult TV hit Doctor Who. From award-winning writer Mark Gatiss (TV’s Sherlock) and director Terry McDonough (TV’s Clue), the biogaphy movie takes us back to Nov. 23, 1963, when the first episode of Doctor Who was broadcast on BBC One. About an alien Time Lord exploring space and time in a spaceship the shape of a police box and called the TARDIS (Time and Relative Dimension in Space), the show brought together actor William Hartnell (David Bradley, Harry Potter movies), who had felt typecast by a run of tough-guy roles and wannabe producer Verity Lambert (Jessica Raine, TV’s Call the Midwife), who was frustrated by the TV industry’s glass ceiling for women. In Saturday afternoon drama Doctor Who, filled with time travel and monsters, William and Verity found hope and challenges. Along with novice director Waris Hussein (Sacha Dhawan, After Earth) and BBC Head of Drama Sydney Newman (Brian Cox, Rise of the Planet of the Apes), the team launched the longest-running science-fiction series ever. An Adventure in Space and Time premiered on BBC America in November 2013 in celebration of the 50th anniversary of Doctor Who. and a bonus disc with “An Unearthly Child,” the first Doctor Who adventure, and more extras, including “The Pitch of Fear,” a sketch starring Mark Gatiss and David Williams (TV’s Little Britain) taking a comedic look at the show’s creation.